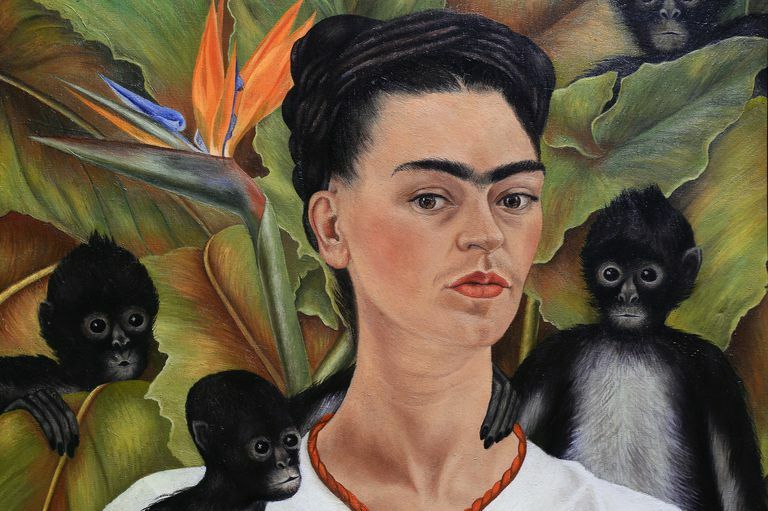 Frida Kahlo's painting, Self Portrait with Monkeys. Magical realism, or magic realism, is an approach to literature that weaves fantasy and myth into everyday life. What’s real? What’s imaginary? In the world of magical realism, the ordinary becomes extraordinary and the magical becomes commonplace. Also known as “marvelous realism,” or “fantastic realism,” magical realism is not a style or a genre so much as a way of questioning the nature of reality. In books, stories, poetry, plays, and film, factual narrative, and far-flung fantasies combine to reveal insights about society and human nature. The term "magic realism" is also associated with realistic and figurative artworks — paintings, drawings, and sculpture — that suggest hidden meanings. Lifelike images, such as the Frida Kahlo portrait shown above, take on an air of mystery and enchantment. There’s nothing new about infusing strangeness into stories about otherwise ordinary people. Scholars have identified elements of magical realism in Emily Brontë's passionate, haunted Heathcliff (Wuthering Heights, 1848) and Franz Kafka’s unfortunate Gregor, who turns into a giant insect (The Metamorphosis, 1915). However, the expression “magical realism” grew out of specific artistic and literary movements that emerged during the mid-twentieth century. In 1925, critic Franz Roh (1890–1965) coined the term Magischer Realismus (Magic Realism) to describe the work of German artists who depicted routine subjects with eerie detachment. By the 1940s and 1950s, critics and scholars were applying the label to art from a variety of traditions. The enormous floral paintings by Georgia O'Keeffe (1887-1986), the psychological self-portraits of Frida Kahlo (1907-1954), and the brooding urban scenes by Edward Hopper (1882–1967) all fall within the realm of magic realism. In literature, magical realism evolved as a separate movement, apart from the quietly mysterious magic realism of visual artists. Cuban writer Alejo Carpentier (1904-1980) introduced the concept of “lo real maravilloso" ("the marvelous real") when he published his 1949 essay, “On the Marvelous Real in Spanish America.” Carpentier believed that Latin America, with its dramatic history and geography, took on an aura of the fantastic in the eyes of the world. In 1955, literary critic Angel Flores (1900-1992) adopted the term magical realism (as opposed to magic realism) to describe the writings of Latin American authors who transformed “the common and the everyday into the awesome and the unreal." According to Flores, magical realism began with a 1935 story by Argentine writer Jorge Luís Borges (1899-1986). Other critics have credited different writers for launching the movement. However, Borges certainly helped lay the groundwork for Latin American magical realism, which was seen as unique and distinct from the work of European writers like Kafka. Other Hispanic authors from this tradition include Isabel Allende, Miguel Ángel Asturias, Laura Esquivel, Elena Garro, Rómulo Gallegos, Gabriel García Márquez, and Juan Rulfo. Today, magical realism is viewed as an international trend, finding expression in many countries and cultures. Book reviewers, booksellers, literary agents, publicists, and authors themselves have embraced the label as a way to describe works that infuse realistic scenes with fantasy and legend. Elements of magical realism can be found in writings by Kate Atkinson, Italo Calvino, Angela Carter, Neil Gaiman, Günter Grass, Mark Helprin, Alice Hoffman, Abe Kobo, Haruki Murakami, Toni Morrison, Salman Rushdie, Derek Walcott, and countless other authors around the world. 1. Situations and Events That Defy Logic: In Laura Esquivel’s lighthearted novel, Like Water for Chocolate, a woman forbidden to marry pours magic into food. In Beloved, American author Toni Morrison spins a darker tale: An escaped slave moves into a house haunted by the ghost of an infant who died long ago. These stories are very different, yet both are set in a world where truly anything can happen. 2. Myths and Legends: Much of the strangeness in magic realism derives from folklore, religious parables, allegories, and superstitions. An abiku — a West African spirit child — narrates The Famished Road by Ben Okri. Often legends from divergent places and times are juxtaposed to create startling anachronisms and dense, complex stories. In A Man Was Going Down The Road, Georgian author Otar Chiladze merges an ancient Greek myth with the devastating events and tumultuous history of his Eurasian homeland near the Black Sea. 3. Historic Context and Societal Concerns: Real world political events and social movements entwine with fantasy to explore issues such as racism, sexism, intolerance, and other human failings. Midnight’s Children by Salman Rushdie is the saga of a man born at the moment of India’s independence. Rushdie’s character is telepathically linked with a thousand magical children born at the same hour and his life mirrors key events of his country. 4. Distorted Time and Sequence: In magical realism, characters may move backward, leap forward, or zigzag between the past and the future. Notice how Gabriel García Márquez treats time in his 1967 novel, Cien Años de Soledad (One Hundred Years of Solitude). Sudden shifts in narrative and the omnipresence of ghosts and premonitions leave the reader with the sense that events cycle through an endless loop. 5. Real World Settings: Magic realism is not about space explorers or wizards; Star Wars and Harry Potter are not examples of the approach. Writing for The Telegraph, Salman Rushdie noted that “the magic in magic realism has deep roots in the real.” Despite the extraordinary events in their lives, the characters are ordinary people who live in recognizable places. Is The Buried Giant pure fantasy, or has Ishiguro entered the realm of magical realism? Perhaps books like this belong in genres all their own. Arana, Marie. “Review: Kazuo Ishiguro’s ‘The Buried Giant’ defies easy categorization.” Washington Post 24 Feb. 2015. Print. Washington Post Digital Access. Web 9 Oct. 2017. Fetters, Ashley. “The Origins of Gabriel Garcia Marquez's Magic Realism.” The Atlantic 17 Apr. 2014. Print. Atlantic Archive. Web 9 Oct. 2017. Flores, Angel. "Magical Realism in Spanish American Fiction." Hispania 38 (May1955): 187-192. Print. JSTOR. Web 11 Oct. 2017. Keegan, Ken. “Why Fabulist and New Wave Fabulist Stories in an Anthology Named Paraspheres?” Paraspheres: Extending Beyond the Spheres of Literary and Genre Fiction. Ed. Rusty Morrison and Ken Keegan. Omnidawn Publishing, 2006, pp. 625-637. Leal, Luis. “Magical Realism in Spanish American Literature.” Trans. Wendy B. Faris. Magical Realism: Theory, History, Community. Ed. Lois Parkinson Zamora and Wendy B. Faris. Duke University Press, 1995, pp. 119-124. Ríos, Alberto. “Magical Realism: Definitions.” Arizona State University. 23 May 2002. Web 11 Oct. 2017. Rushdie, Salman. “Salman Rushdie on Gabriel García Márquez: His world was mine.” The Telegraph. 25 Apr. 2014. Print. Telegraph Media Group. Web 9 Oct 2017. Study Guide for "A Very Old Man With Enormous Wings"
What Are Motifs in Fiction and Nonfiction? What Is Psychological Realism in Writing? What Is Didactic Writing and Didacticism?